Every year, the FOX television network introduces new TV series, which are either cancelled or renewed by the season’s end. Likewise, among existing shows which were initially renewed and returned for another installment, there are always some under-performers that wind up as the television vulture’s TV dinner du jour. Although everyone understands the Nielsen ratings usually play a big role in TV cancellations and renewals, most fans do not get to participate in that system. Since so many viewers’ opinions do not factor into the network’s programming decisions, we are offering you the chance to submit your own FOX TV show ratings to us, instead. You can vote on the following FOX TV series that have premiered (so far) during the 2017-18 television season: 9-1-1, Beat Shazam, Bob’s Burgers, Brooklyn Nine-Nine, Empire, The Exorcist, Family Guy, The Four: Battle for Stardom, Ghosted, Gordon Ramsay’s 24 Hours to Hell and Back, Gotham, Hell’s Kitchen, LA to Vegas, The Last Man on Earth, Lethal Weapon, Love Connection, MasterChef, MasterChef Junior, The Mick, New Girl, The Orville, The Resident, Showtime at the Apollo, The Simpsons, So You Think You Can Dance, Star, and The X-Files. What do you think? 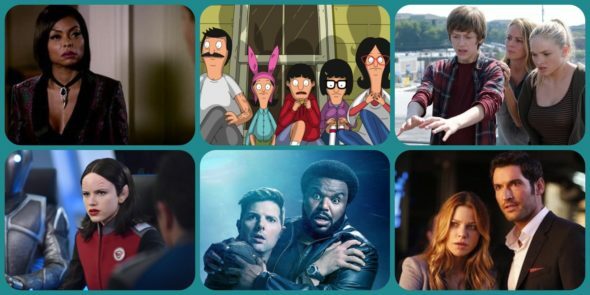 Which FOX TV series do you rate as wonderful, terrible, or somewhere between? If it were left up to you, which FOX TV shows would be cancelled or renewed for another season? Don’t forget to vote, and please share your thoughts, below. What happened to “Crime Watch Daily?” Friday,9/7 showing previews of what was coming Monday. Monday 9/10 it was replaced by some other crap. Snowfall makes me sick. With the Drug epidemic and our kids dying and this show shows how to make money selling drugs, are you kidding me. I will fight to get this show off the air with my coalition who help parents and family members who have lost their children due to drugs. This is thouroughly appalling!!! I hate watching fox shows they always cancel good shows. I will not watch fox shows any longer Lucifer was the last straw. I loved that show and now they cancelled it. Another good show they cancelled I should have known better than to watch a show on fox.